« Christian values: what are they? Noli Me Tangere is described on the back cover as ‘The novel that sparked the Philippine revolution’. Which sounds a bit hyperbolic, but apparently the publication of the novel in 1887 was an important moment; even more so, Rizal’s subsequent execution for rebellion, sedition and conspiracy. So it’s a political novel, an unusually early example of a colonial novel written from the perspective of the colonised. In this case, the main representatives of colonial power are from the church rather than the civil authorities. That’s not unique; religion has often been an important tool of empire and post-colonial novels are full of priests and nuns and, above all, church schools. But the Philippines does seem to have been an extreme case, where the religious institutions were more powerful than the civil authorities. Which means that the book is peopled with villainous friars — cruel, vindictive, scheming, manipulative, hypocritical, lustful, oleaginous — and it reminded me of those early gothic novels which always seemed to have sinister, black-hearted monks in them. * Especially since it’s never shy of a bit of melodrama. In fact, it’s a rather lumpy mixture of melodrama, satire and long, wordy political discussions, and I can’t say all of it held my attention equally. I liked it most when it was at its most exaggerated — ferociously satirical or floridly gothic — and I found it fell a bit flat when it aimed for genuine sentiment. A mixed bag for me, then. Bits of it are genuinely brilliant, though. There’s a scene with gravediggers at work in a badly over-crowded cemetery which is wonderfully morbid, for example; and a grotesque portrayal of an ageing Filipina who is so determined to marry a Spaniard and be ‘Spanish’ herself that she marries a useless, feckless man whose only quality is that in the Philippines his nationality gives him an ersatz respectability, then insists on only speaking broken Spanish. Noli Me Tangere by José Rizal, translated by Harold Augenbraum, is my book from the Philippines for the Read the World challenge. * In my memory they do, anyway, although glancing through a few plot synopses on Wikipedia, they were just as likely to be sinister, black-hearted aristocrats. Perhaps I’m just thinking of The Monk. 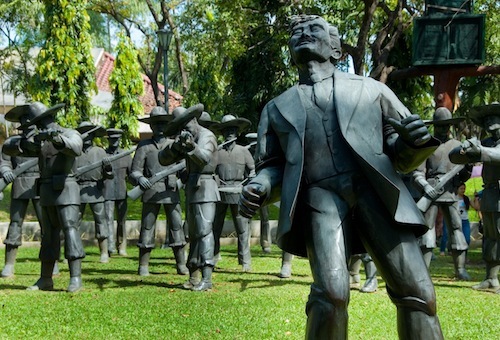 » The memorial of the execution of José Rizal is in Rizal Park in Manila. Rizal is apparently a full-on national hero in the Philippines, so there were many statues to choose from, but this is the most dynamic; the most in keeping, perhaps with the tone of the book. The photo is © Joshua Bousel and used under a CC by-nc-sa licence.